Though the Warhammer-spigot has been turned on at full blast in recent years, it’s hard not to notice that the 40k variation of the universe hasn’t had quite as many smash hits as its classic counterpart during this period. Cyanide Studio worked with the 40k license recently on another game based on Space Hulks; huge, abandoned space ships that contain danger and opportunity in seemingly equal measure. Their latest offering, Space Hulk: Tactics, represents a significant departure from the team’s previous work, and though it won’t be for everyone, it makes a strong case for being one of the better 40k-themed Warhammer games to release in some time. Adapted from the board game Space Hulk, Tactics is a methodical turn-based strategy game that pits Space Marine Terminators against Tyranid Genestealers, with matches taking place in the cramped and claustrophobic rooms and hallways of these wrecks floating through space. You can play as either of the two factions, and to ease you into the experience there are campaigns for both, which have very different playstyles. The Space Marine campaign involves exploring one of these hulks to determine the fate of another group who ventured onto the seemingly abandoned ship. With the Space Marines, each match starts with you warping your terminators into starting positions on grid-based maps. Each Terminator in your squad of 5 has four action points to work with, and you will need to use them wisely as each action such as moving, turning or using abilities will quickly consume them. Maps are comprised of mostly narrow hallways just one square wide, with occasional rooms that have only slightly more space to maneuver. Since Terminators are adorned with some of the beefiest power armor around and are roughly the size of a fridge, they cannot see past each other in a straight line, so you need to be extremely careful and deliberate when it comes to positioning your squad. 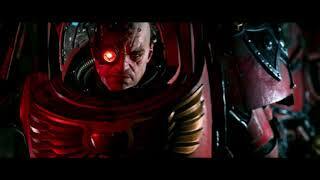 Despite the heavy armor, it only takes one successful attack from a Genestealer to take down a Terminator. If a Terminator attempts to use a melee attack to kill a Genestealer, the Genestealer can counter-attack and kill the Terminator, so it is generally advisable to use ranged attacks for most situations. Further complicating things are different classes of marines, and different weapon types. At the start of the campaign you will mostly just have access to basic marines who can perform a simple melee or ranged attack with a bolter. As you progress (or if you try a mode besides the campaign), you gain access to other types of marines such as assault specialists, Apothecaries and Librarians. Assault marines specialise in direct combat and are most effective when they have a good line of sight, while the Apothecary can revive a squad-mate who goes down right in front of them, so you typically want them further back. The Librarian is mostly useful for his powerful spells that can wipe out several enemies at once, or block a passage so you don’t get flanked, however he uses a unique type of currency that only allows for a limited number of spells to be used each match. The way the levels are typically set up, Genestealers can spawn in at set locations and surround the Terminators from multiple angles. I found the best approach most of the time was to keep my squad of marines close together, using overwatch to cover as many angles as possible. A single marine in the right spot can lock down a Genestealer spawn point, but I only found this useful during some missions. Matches will have different objectives for the Space Marines and Genestealers. Though the Genestealers usually just have to kill either all or some of the Terminators to win, the marines have a more varied set of tasks; they might need to defend an objective, pick up an object and deliver it to a extraction point, kill a special Genestealer, or simply move through the level to an extraction point without taking too many casualties. Another important mechanic that is shared between both factions are special cards that serve a few purposes. Each turn, you gain access to a semi-random selection of three cards that have associated bonuses, such as improved attacks, increased range, or additional action points. As the Space Marines, you can choose to play these cards, with the bonus only applying to a single specified Terminator, or convert the card to action points, with the number of points gained varying depending on the usefulness of the card. As you progress through matches, the cards become more powerful, and using them effectively is critical if you want to win. During the Space Marine campaign, much of the progression for your soldiers comes from unlocking improved cards. Between missions, you move around on a map consisting of connected nodes; some of these nodes contain missions, some resources that can be used to unlock better cards or upgrade modules for your soldiers. Eventually, more elements are added to this meta-game such as locked doors, keys and teleporters. Some missions are optional and some are required; the longer you spend in an area moving around to get resources and unlock doors, the higher the chance of running into enemies that can force either optional missions, or temporarily leaving one of your soldiers behind to defend the rear which will make them unavailable in the next mission. This meta-game works well as it provides some context for the matches and feeds into the soldier progression without feeling bloated or over-complicated. 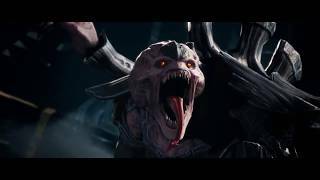 Though playing the Space Marines might feel a bit familiar to anyone who has played other turn-based strategy games such as Xcom, the Genestealers are more unique, with each turn for this faction coming in two sections. In the first phase, cards can be converted to blips, which are groups of Genestealers who have not yet been seen by a Terminator. Blips are placed on set spawn-points throughout the level, and vary in type, with different blips containing different types of Genestealers referred to as biomorphs. Each blip can contain between zero and three Genestealers, with the number and types of enemies being revealed once the blip is seen by a marine, or when the Genestealer player chooses to reveal the blip. Each Genestealer turn starts with optionally converting a card to spawn more units, meaning this faction can continue to bring in fresh units throughout a match, and that units are far more disposable. Once the cards have been converted and blips placed at spawn points, you can progress to the second phase. During this phase, you can move Genestealers or blips, attack enemies and use cards. Genestealers, or blips, have six action points instead of four, but can only use melee attacks to do damage. Like the Space Marines, there are variations on Genestealers with different traits; one type can absorb a fatal blow, while another releases a cloud of deadly gas when killed. Generally speaking, playing as this faction requires some pretty extreme patience. As matches unfold you will need to try different angles and tactics until you manage to get one close enough to the Terminators to do some damage. Since Genestealers can take out a Space Marine with a single attack, especially when flanking from behind, successfully sneaking into their flanks and taking several out in a single turn can be immensely satisfying. There are two difficulty settings, and while I found the lower (default) setting for the campaign to be perfect for the Space Marine campaign, the early Genestealer missions seemed more challenging. The AI for the Space Marines are generally very effective at covering themselves with overwatch, and I had a hard time breaching their defenses early on while still learning the faction. The Genestealer AI on the other hand can be a bit inconsistent; at times they will sit back and wait for an opening, while at other times they will endlessly throw themselves into zones covered by overwatch and a sure death. It is also worth noting that there are a lot of randomised elements in the game; when attacking, there is always a chance of success or failure based on dice rolls which are exposed on the side of the screen. Before you attack, you can see the likelihood of whether the attack will succeed, and this level of unpredictability does serve to make things more exciting, especially in close matches where the outcome of a single shot mean the difference between success and failure. I did sometimes struggle to determine where the percentages predicting the outcome of an attack came from. The game auto-saves at the beginning of each mission and you can quick-save at any time, so the moments where my seemingly meticulous plans were waylaid by unlucky dice rolls rarely resulted in too much lost progress. Additional complexity is added to matches in the way of different elements present on maps that affect both sides. The most common obstacle are doors, which can be opened by moving up to them and using an action point to interact, or by shooting them. Turrets are present on many maps and will by default target both sides, but Terminators can access consoles and switch them to only attack Genestealers. Some levels contain teleporters that both sides can use to move quickly from one part of the map to another. Poison fungus and explosive barrels can be shot, which will produce deadly gas or, well, explosions which behave as you might expect. Though the amount of different mechanics might seem overwhelming, the game generally does a great job of easing you into things, and when new elements are introduced a help window will appear at relevant moments. There is a problem however that I suspect will turn many players off: just how slowly the matches unfold. Every action is typically associated with a lengthy animation, so you will spend a good deal of time watching your Terminators carry out orders; walking, turning and shooting at incredibly sluggish rates. The animations are absolutely appropriate for these heavily-armored men, but some way of skipping or speeding things up would have been appreciated. This is even more painful when waiting for the AI to take their turn; again there is no way to speed through this, so you’ll end up spending a lot of time just watching the AI make their moves. An option to speed up or skip enemy turns would have gone a long way to making the pace of matches less glacial, at least when playing offline. Once you venture past the campaign, there are loads more ways to continue playing matches both offline and online. There is a Skirmish mode, with a solid selection of official skirmishes on unique maps that can be played as either side. There is also a mission editor that is very easy to use and lets you create custom level layouts and objectives. You can also choose to customise the look of your Terminators for skirmishes and multiplayer, and create custom squads with different combinations of unit types. The multiplayer options are equally robust, with the ability to quick match for ranked and unranked play against human opponents, as well as against AI. It is worth noting that I found the matchmaking to be a bit on the slow side, likely due to a very low player population. There are a couple of different options for turn times, but no matter what, playing against humans tends to be even slower than playing against AI opponents as humans tend to take longer to plan moves, even with the shortest available turn times. Still, for those looking for a more unpredictable challenge, this will likely be the preferred way to play. 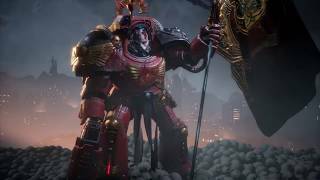 With so much experience in the Warhammer 40k universe, it is not surprising that Cyanide Studio are able to do a great job of capturing the look, sound and feel of the setting. Though the game is best played from the isometric ‘tactical’ view, it is possible at any time to switch to first person when playing as the Terminators, and entire matches can be played this way. This option is ultimately a gimmick since it is impractical to play from this perspective, but it can be fun to pop into first-person mode to see the maps as your soldiers do. The levels are generally very detailed though somewhat lacking in visual variety. A cinematic camera will trigger randomly on some actions in much the same way as recent Xcom games, and it works well during combat, but watching a cinematic, zoomed-in view of one of your Terminators lumbering up a hallway is not exactly compelling viewing. Though its appeal will likely be limited and the pace of matches too slow for some, Space Hulk: Tactics is a robust and well put together turn based strategy game. Given the significant amount of depth and complexity present here, I was really impressed at how well the game eases you into things and makes what could have been a daunting learning curve a fairly smooth one. Whether you are a fan of Warhammer or not, Space Hulk: Tactics deserves a serious look if you are in the market for a slower paced but well crafted game. Looks and sounds good across the board, though visual variety of levels is rather limited. The original soundtrack is low-key but serves to heighten the atmosphere effectively. The Space Marines and Genestealers present very different play styles within the turn-based strategy framework, with lots of options for customising your squads and a decent amount of different elements and objectives in matches. The pace will likely prove too methodical for some. Full campaigns for both factions with generally well written and voiced stories do a great job of easing you into the experience. Offline skirmishes and an easy to use mission creator offer lots of ways to keep practicing once you finish the campaigns. Both ranked and unranked competitive multiplayer matchmaking is available, though it is currently a bit slow, and waiting for human opponents to complete their turns can be patience testing. The game runs well with brief load times and is generally polished, though I did encounter a few minor glitches with the UI.